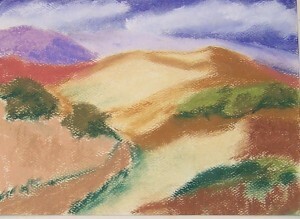 This entry was posted on Wednesday, April 20th, 2011 at 1:04 pm	and is filed under 100 Pastel Challenge, Color, Landscapes, Paintings, Pastels. You can follow any responses to this entry through the RSS 2.0 feed. You can leave a response, or trackback from your own site. I think that i’m a blue lover. Anything that contains blue soothes me. I like the color combinations in this picture. holy schmokies you’re going fast now! Leila, I missed you in LA by half a day!